interested in these JJS BANK vacancies they can submit their application form in a prescribed format on or before 21-05-2018. Preference will be given to the candidates who are having working experience in any NBFC or Banking Sector. 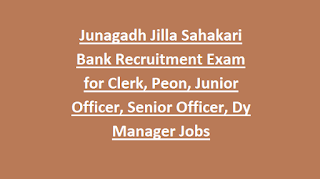 Candidates selection will be based on written exam and interview for this Junagadh Jilla Sahakari Bank vacancies. More information such as age limits, pay scale, age limits, qualification and application form submission procedure and other details are given below for this Junagadh District Cooperative bank jobs. Last date to reach the application form to JJS BANK is 21-05-2018. 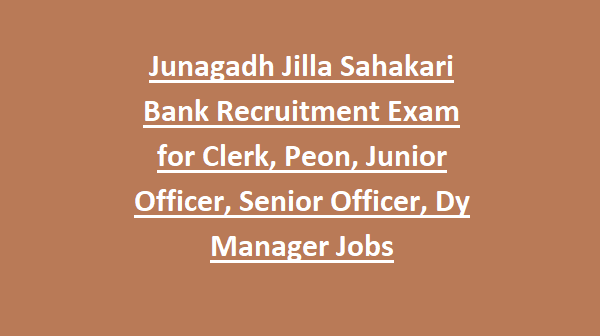 There are total 154 posts in this Junagadh District Sahakari bank Recruitment. For post wise vacancies please refer official notification. Candidates selection will be based on written exam and personal interview for this Junagadh Sahakari bank recruitment. Candidates who are having necessary qualifications and work experience they can apply online for these JJS Bank vacancies. Last date to reach the application to JJS Bank is 21-05-2018.